Keep cozy with this Reformation 500 sweatshirt. It has an adjustable hood and is made of 50% cotton/50% polyester. Charcoal. The countdown is on to the celebration of the 500th anniversary of the Reformation on October 31, 2017! Our collection of gifts will help you proudly pronounce the Lutheran confession of faith in your own, unique way! 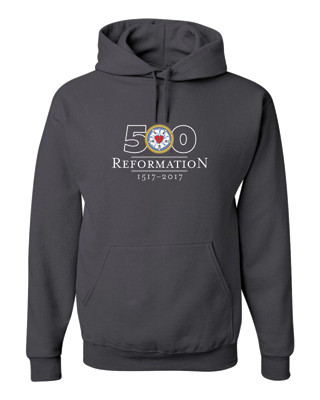 View all Reformation 500 items here. Bought one for our college age son. He liked it so much, we had to buy him another one. Great quality hoodie with nice graphic...and a good conversation starter celebrating the Reformation. This is a great quality, attractive, vibrant print and charcoal grey color. Our staff all has this sweatshirt. Everyone loves it. Great way to promote the 500 anniversary.